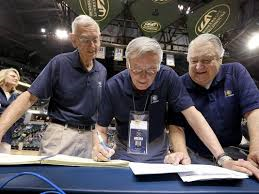 At the time this story was published, three men had been with the Pacers’ stat crew from the beginning of the franchise in 1967. Furimsky passed away a few months later, but York and Bevan remain. To say they go back to the first game the Pacers ever played robs them of an assist. They go back further than that. Bill York, Paul Furimsky and Bill Bevan were keeping stats for the franchise well before the Pacers played their first game against the Kentucky Colonels on Oct. 14, 1967. They worked the six exhibition games prior to that and the call-out scrimmages in June, when dreamers from all over central Indiana came out to see if they could become a professional basketball player.